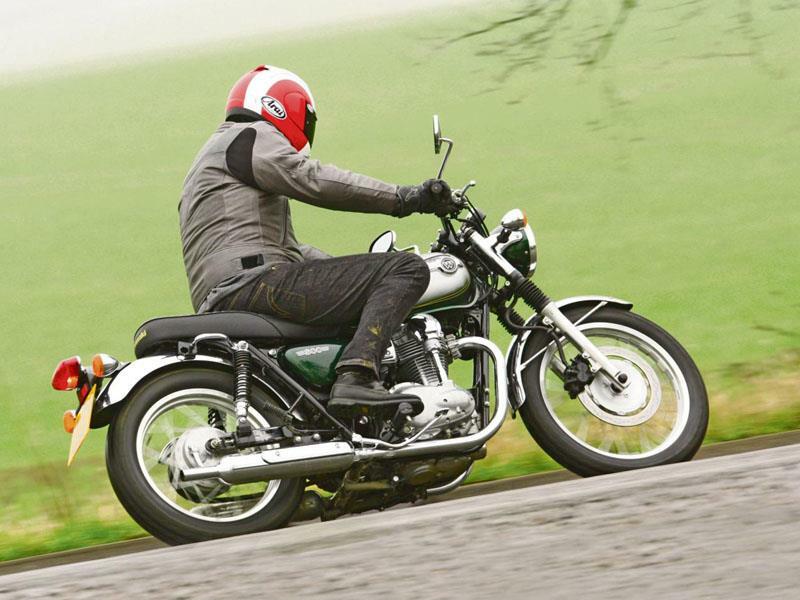 Our first test of Kawasaki’s new W800 suggests that Britain’s own Triumph, after for five years having things all its own way in the ‘retro roadster’ class, has a new, real rival on its hands. Not only is the Kawasaki W800 cheaper and better specced than its closest Bonneville rival, the Kawasaki’s uprated engine means there’s now no discernible performance difference either. The Kawasaki W800’s handling compliments that perfectly. Its old school, upright riding position, cute, slim proportions and wide-ish bars blend seamlessly with the responsive but soft delivery to make the W800 ridiculously easy to just get on and ride. Only when you start to push silly-hard does the single front disc start to seem inadequate (but the rear drum is sensitive and useful), the forks seem boingingly oversoft, the big 19-inch front wheel and chunky, deep-treaded, period-style Dunlop tyre seem to under-steer and scrabble a little for grip. The rest of the time it’s fine. The two biggest updates to the Kawasaki W800 are the growth in capacity and switch to fuel injection. The Kawasaki W800’s five-mill overbore takes it up from 676cc to 773cc, and is thrummingly pleasant: brisk enough for this kind of bike and happy to cruise along at 80-90. Think ‘middling car performance’ but with a bit of extra pep away from the lights and you won’t be far wrong. The Kawasaki W800’s new fuel-injection helps in this and is faultless: crisp, instant throttle response with nary a glitch or hiccup anywhere in its revs. There’s not much point wringing its neck, mind, as things start to tail off and get a bit breathless above 5000rpm or so. The only other slight criticisms are that, if anything, it’s a little bit TOO civilised: a touch too soft, smooth and quiet. It really is crying out for a set of rortier pipes with which to bounce decibels off some village cottages. Overall, though, the new W800’s performance is not just adequate, it’s amazingly user-friendly both for retro fans and novices alike. The Kawasaki W800 doesn’t just have the authentic specification, it’s beautifully and classily done, too: the two-tone paint is deep, the chrome good, the alloy finishes beautiful. It’s too early to pronounce on reliability yet, but on the strength of how it’s built and put together the W800 is a pretty classy act. On face value the new Kawasaki W800, seems pricey compared to the base Triumph Bonneville. But that’s not comparing like with like. In truth, the closest rival to the W800, with its wire wheels, twin dials, two-tone paint, fork gaiters and so on, is the Bonneville T100 which is actually £100 MORE and still not as well specced. On that basis, the Kawasaki W800 is decent value. Triumph should be worried. 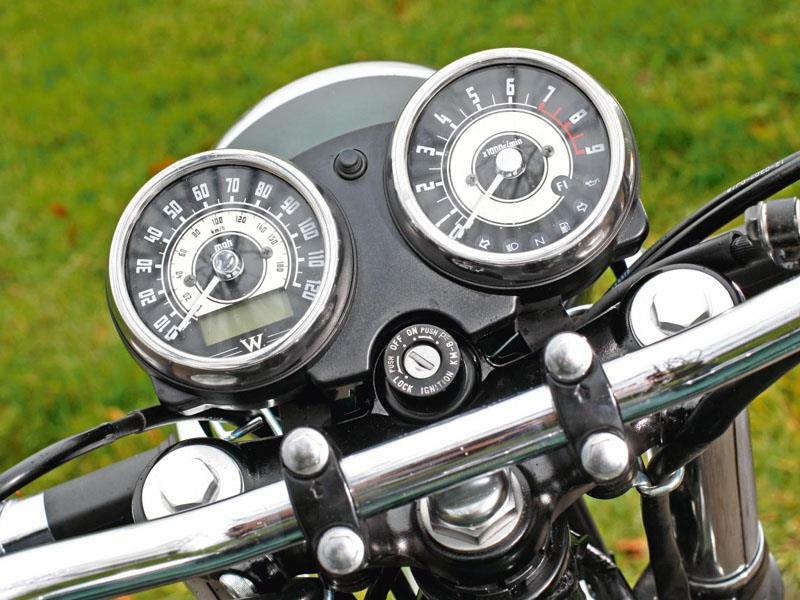 The old W650 was generally considered an authentic and classily-detailed ‘reproduction’ thanks to its great-looking engine, alloy-rimmed wire wheels, proper chrome mudguards, retro-style twin dials, kickstart, knee pads etc. But the new Kawasaki W800 takes things up another level. There’s a new, more ‘ribbed’ seat and lower handlebars. The engine’s cylinders, rear hub/drum and fork sliders are now alloy finished instead of black and there are new, improved mirrors, exhaust heat shields, a different tank badge and more. It all adds up to a gorgeously – yes really – complete and authentic machine which is simply leagues above, say, Triumph’s Bonneville. 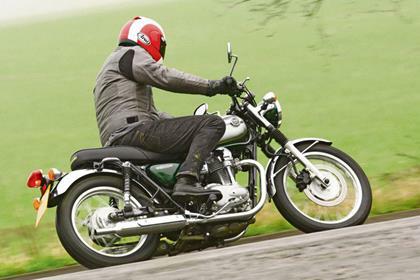 16 owners have reviewed their KAWASAKI W800 (2011-on) and rated it in a number of areas. Read what they have to say and what they like and dislike about the bike below. 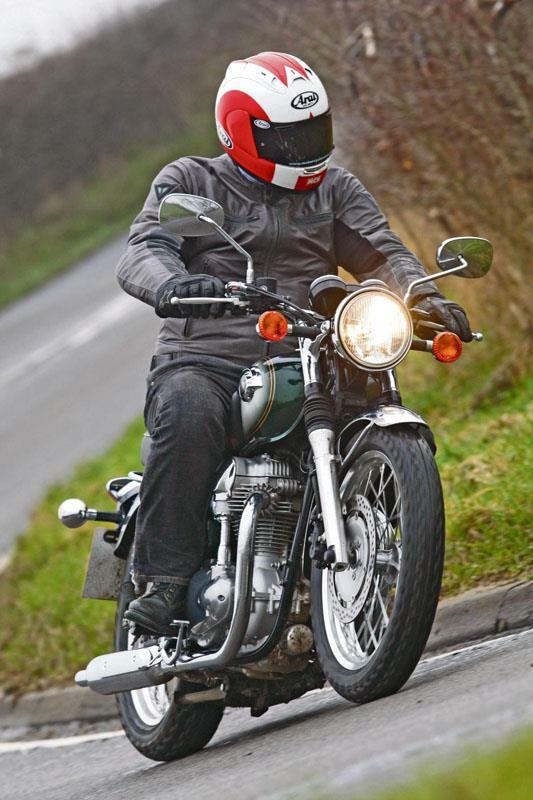 The bike is very comfortable to ride (way better than the W650) and a virtually maintenance free bike. A well balanced bike with a very secure easy riding experience. Excellent value for money. Fantastic manufacturer support as regards any technical issues/updates/recalls. Exhaust note is very quiet which results in a very sophisticated motorcycle. More exhaust volume and a bit more mid range power is easily tapped into by removing the rubber air filter snorkel and even more so by removing exhaust baffles. Apparently the ECU is self learning and can be reset by disconnecting and reconnecting the battery. Warm idle speed and cold idle speed are also easily adjustable via two screws. I have removed baffles and snorkel and my bike sounds like an old 70's Bonneville and goes like one too (I am old enough to compare), virtually the same bore and stroke so shouldn't be a surprise really. Bike is a cruiser and not set up for high speed performance above 100mph although it is well capable. Best settings for rear springs is number 2 (next to softest). If you set these harder you will get a speed wobble at 80-85mph. I can ride the bike for 2 hours easily without break, no cramps at all. Power delivery is very sophisticated and evenly distributed. You can ride around in 5th gear and there is loads of torque. Only need to change down if you are going really slow. Takes a bit of getting used to to realise that you don't need to keep going up and down the gearbox (loads of torque from 1,000 revs with baffles out). The bike is just so easy going and an absolute joy to ride. There are manufacturer recalls for new fuel pump and throttle body holders as some bikes have had issues. My fuel pump was failing but throttle bodies were fine (fuel pump had a high pitched whine which was worst on start up and bike did once lose power and stopped prior to fuel pump replacement at manufacturers cost/recall). Also a recall to check/replace wiring harness and fit plastic protective cover. Only requires oil and filter change which you can do youself. I use fully synthetic oil which is more expensive. You have all you need for a retro bike. Digital clock is a nice touch together with low fuel warning messenger. Great to have rev counter and speedo.  Paid 4,000 pounds from a dealer for bike with 13,000 miles. Paid the advertised price of 4,000 pounds. Lovely looking but lots of vibrations. Lovely looking but lots of vibration. Took this beautiful looking bike out for a test ride today. I'm 6ft 3"....... It's a bit small for me. After an hour and 25 miles on B roads, A roads and 15minutes on a motorway I knew it wasn't for me. I have read about vibrations on the bike......Jesus it was like riding a pneumatic drill. I couldn't believe the vibrations through the pegs, handle bars etc. Getting back on my f800 gs was like sinking in to a sofa. Stunning looking motorcycle for the smaller rider who can live with lots of vibration. Gear the expectations and you waon't be dissapointed remember this bike is about relaxed, 60 mph crusing not a full on performance machine and you'll be very happy. I've had two of these, both the green and chrome originals. The first I bought new (early 2011 build) and put around 40,000km on it, and while I still had that one I bought a second (late 2012 build) with 1500km on it from an old fellow who decided it was too heavy for him. I've run old Brit bikes for years and the W800 feels and rides pretty much like a more sophisticated, slightly heavier and more substantial version of a 60's 650 or 750 twin. Been riding for nearly 50 years, many years of touring, owned a lot of big bikes and don't drive a car; the W800 is a great bike. The suspension is pretty basic, about the same as my 2 BSAs in fact, although the W800 front end is better than the Beeza's. The seat is OK for a couple of hours, but it is a bit soft and while it is comfy for the passenger, the bike is physically quite small and the seat a tad short for any long distance pillioning. Bumpy roads - lots of them here - start to knock the stuffing out of you after a couple of hours as well. The bike tours well and will happily sit on the freeway at 120kmh with enough in reserve for passing if needed, or it can be used to plod around at 75kmh in top in country lanes. Brakes are fine for the bike - the single front disk works well but does feel a tad spongy, rear drum works exceptionally well. A lot of torque down low - max is at 2300rpm and it is flat from there to redline and around 45ft/lbs from memory, but at 48hp and 215kg wet it really could do with a few more just to give a bit of an edge at times. There are some vibes up to around 3500rpm, but from there to redline it is very smooth. A genuine 110kmh (local highway limit) is just on 4000rpm and it is right in the powerband and vibe free. The engine is mechanically quiet and the cam gear drive can just be heard. Gearbox is fine with decent ratios, although my first one would jump out of 5th gear unless it was firmly selected. The engines take about 10,000km before they are fully freed up and performing at their best. I know of one with well over 100,000km on it, and it has been problem free. Sole fault on the first was a blown indicator bulb around 30,000km. When I sold that one the original chain and sprockets were still in perfect nick, brakes original and still around 60% and the valves had never needed shimming. I've only put around 8000km on the second and no problems are expected. Build quality and paintwork is very good, apart from the headlight shell everything is steel, not plastic, Allen bolts are used throughout, wiring is well laid out and of very good quality. The bike has a very solid feel to it. Nice gauges and a reasonable headlight. I do my own servicing, change the oil and filter every 5000km, checked the valves at 18,000 and 32,000km, no adjustment needed, air filters are washable foam, brakes last well and there's nothing else to really do with them. The first averaged around 68mpg Imperial and the second is slightly better, averaging about 72mpg. I've hit 76mpg on one tank at a constant 80kmh. I do take the bike on longer runs quite often, but most of my mileage has been a daily run to work of around 70km in the countryside at 80-100kmh. The fuel economy drops to the low 60's in stop-start urban traffic. Centre stand, toolkit, a couple of occy strap tie down points, external helmet lock, and adjustable clutch and brake levers are standard. No headlight flash button, power outlets or other wizardry. The best tyres I've found for it (and I've tried a lot as our chipseal roads wear most of them out in 5000km) are the Metzler ME880 on the front and a Michelin Pilot Activ on the rear. Handle better and last longer than any others I've tried. I fitted Hepco and Becker racks and luggage, Eastern Beaver fuse box, Oxford grips, twin 35W LED spotlights and a removable Givi touring screen for bad weather. The alternator can handle the spots and grips without any problems. A usable and attractive motorcycle that delivers on all fronts. 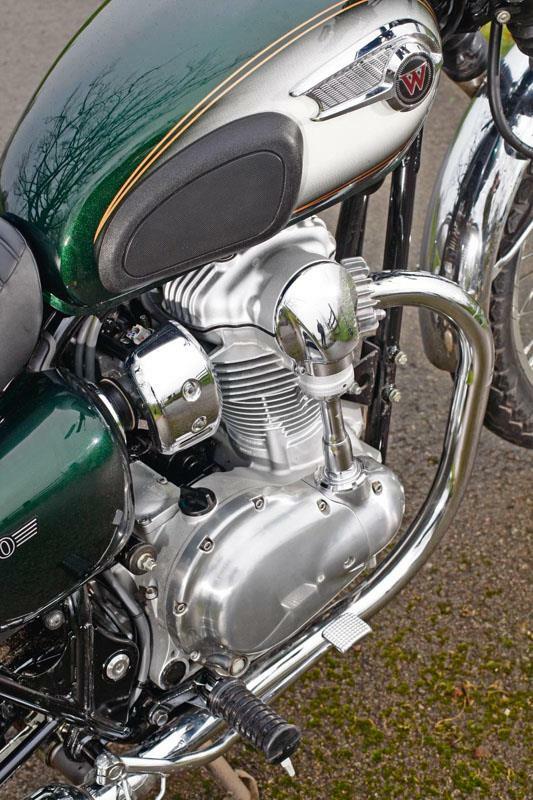 It takes on the Bonneville head to head and is a definite equal. It is a smaller frame and lighter too. 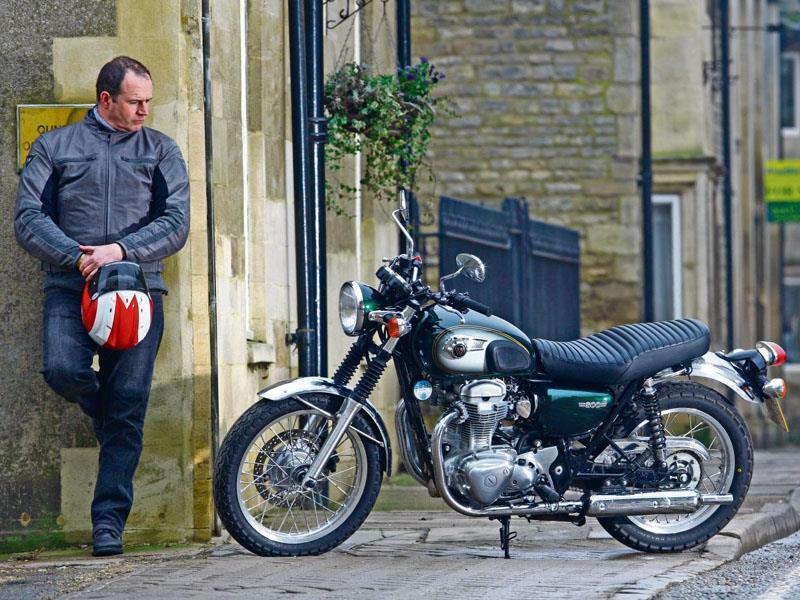 In terms of looks it is arguably a much better looking ''British'' bike and it has faithfully incorporated much of the the old British bike ethos. If you like modern classic this is definitely one to consider seriously. Is skittish at times, but this is the nature of the bike and it's tyres. Well made and smooth and no intrusive vibrations. This is retro with all the painful bits removed. Great for longer distances as well as a sunny Sunday afternoon ride out. Attention to details is superb. The chrome is real and the finish excellent. Too early to be specific at this point in my purchase as I've only had the bike for two weeks. I am making sure I have a Scottoiler fitted soon to preserve chain life and the Renntec rack looks part of the bike with a good chrome finish. Custom injector covers make sure that the bike looks smoother at the injector area as the standard finish lets the bike down. I pretty much have to agree with the review. What I will say is that I do agree with the front end being a bit soft. To rectify this, I put set of Ricor Intiminators into the forks, it toughened up the suspension and gave the bike much better handling into the corners. I have owned the W800 special Edition (Black with Gold wheels) for 2 years now and simply love it. Great bike for everyday use and days out with a pillion, has a great engine which just purrs along but is let down slightly by a weak front brake, and very soft front end but to be honest it just adds to the character which is why I haven't changed a thing. You really cant ride one of these bikes anywhere without grabbing attention, the amount of car drivers that sit at the lights and open their windows to tell me what a great looking 'proper' bike I have is amazing and just about everywhere you park up you will have people straight over to take a good look. For less than 6000 brand new OTR a bargain as well. The W800's the best-looking retro on the market. Just a pity I'm 6 inches too tall to ride one so ignore the ownership scores. I fell in love with this bike in the few seconds it took to get up to 60mph after I opened up the throttle on a brief test ride. This was going to be my first big bike so it had to be just right. Took the Bonnie out also because I always fancied one and well, it's a Bonnie! But the Kwak just grabbed me immediately. Although the Bonneville engine was perky enough, the ride was fidgety, not the comfiest and after 20 mins I was glad it was over. The W800's twin is much smoother yet still impressively torquey & responsive. Ride position was better and as has been said by MCN and Bike, etc., the fit & finish is way ahead of the Triumph. Wasn't sure about having to clean all that chrome and lustrous paint mind, but actually it's a real pleasure because you will fall in love with the damned thing. It's so obviously been made with a rare touch that is largely missing from the sea of plastic that dominates bike showrooms these days. And to quote my SV650 owning mate- "Whoa....It looks SO much better in the flesh!". Of course only one manufacturer dominates the retro class which means much more people will be drawn, Harley-like to the heavyweight 'brand' that is Triumph instead of Kawasaki- better known for lime green sportsbikes. Their loss I'm afraid. Everyday, I realise I made the right choice and although other bikes may enter/exit the garage in the coming years- I'll always have a corner for the W800. Having swopped a Yamaha R6 for this bike I can say I have fallen in love with it. The engine is simply lovely, it is tractable and has plenty of torque. The Yamaha was quicker, but the W800 is much more fun to ride. Around the towns and villages that I drive the engine is beautiful, you don't have to keep changing gear as it will pull really well from below 2000 rpm in second, third, whatever you happen to be in really. The suspension mops up the sleeping policemen without even a murmer. I guess the brakes are not as good as the Yam but, what the hell, I hardly ever use them except if a black cat runs in front of me. I simply love it. Back in late 60's (yeah I'm that old)Yamaha released its version of the Triumph. Kawasaki released it homage to the BSA. The Yammie hung around for a few years in various rebirths, but eventually disappeared. The Kawasaki didn't. I have ridden the W650 (when they 1st came out) & a friends bike. I liked it a lot, sure it did not have heaps of grunt. But performance fitted the retro brief. I have test ridden the W800 & same story, but with a tad more power. The finish on these bikes is great & in Kawasaki's own words, is a homage to the original W1. Compared to a lot of modern Euro & other Japanese bikes, its pretty understated style wise. 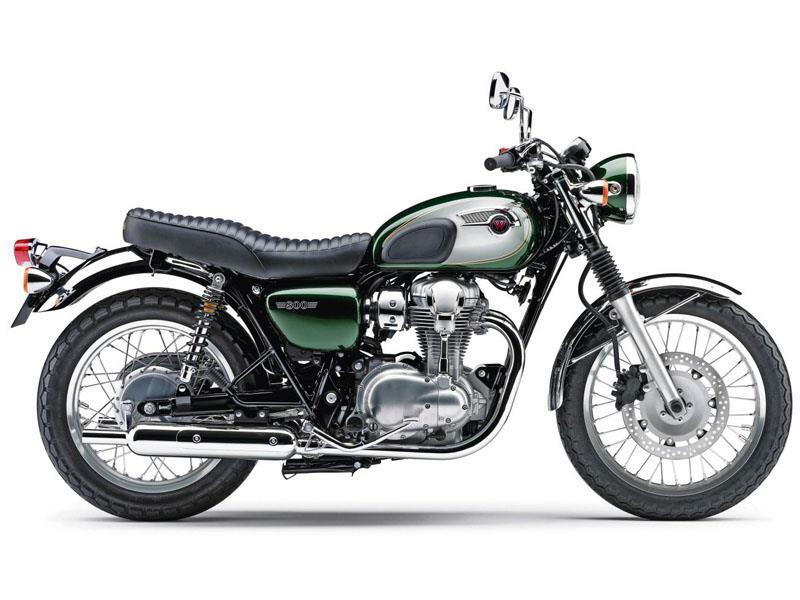 Comparing it to Triumphs (like the T100) is fair, but you have to remember that even these Triumphs are not from the original manufacturer, but from a company that bought the name & is just doing the same thing that Kawasaki is doing in their interpretation of what a "Retro" bike should look like. (Kind of like Triumph's interpretation of a Japanese sports bike, the TT600, a CBR clone). I could also mention that Triumphs are manufactured in Thailand, But lets not go there. Both manufacturers do a good job in the way the bikes are presented, put a 60's Triumph or BSA next to them & you would soon see that the reality is only a nod with a few styling cues. What Kawasaki give you is a complete bike, you don't have to fork out more money on "Extras" like center stand, tool kit, knee pads & so on & the motor is a gem. I'm buying one.